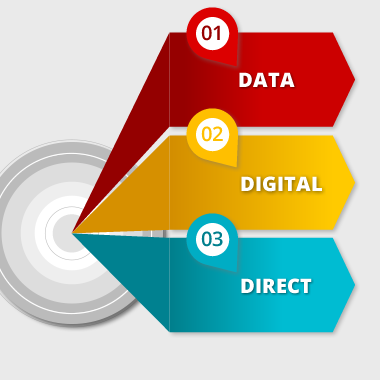 The three cornerstones in everything we do in Data, Digital and Direct. Data is the main cornerstone of what we do. We turn data into information, and information into powerful insights. From this, strategic, measurable and effective communications can be developed. Digital channels, platforms and technologies are constantly evolving. As digital strategists, we continually research and evaluate the best, most effective solutions for our customers. Our focus is digital, but we never forget the foundations of traditional direct marketing. Direct marketing principles are still essential in the digital world. We drive multi-channel marketing campaigns via digital and traditional channels. Our aim is to provide clients with a much needed strategic focused, data-driven marketing approach. Our core philosophy to strategy development is understanding the target audience. We turn data into information and information into powerful insights, from which marketing strategies, CRM solutions and effective communications can be developed. An extensive network of partners ensure only the best people and most cost-effective solutions are selected for your job. Not just those on the pay role. We understand the importance of embracing new technology to become more efficient. After 15 years we also understand that the principles of marketing haven’t changed…and never will. 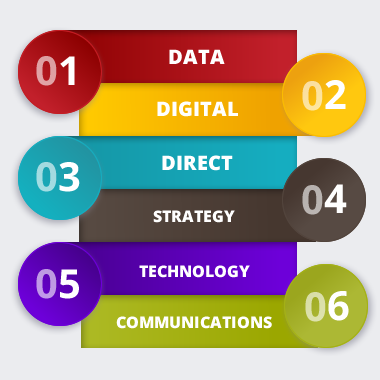 Unlike many companies, we are specialists in data, digital and direct marketing. Combined with the expertise in our network, The Bakery are able to deliver a more comprehensive solution than the competition. We will source the best solutions for your needs, whilst minimise your time and costs. Data is at the core of everything we do. This is how we started and the engine of meaningful, effective and cost-efficient marketing. Data is an under-utilised asset in many organisations. Using data to understand customer behaviour will improve the profitability on direct marketing activity. We use data to measure everything we do. Our approach is based on a test, measure, refine and rollout methodology. Only by knowing what works and what doesn’t work can we maximise the return on campaigns and client ROI. The old saying by John Wanamaker that “50 percent of my advertising is wasted, I just don’t know which 50 percent” can now be defeated by proper use of data. We conduct a range of analysis and segmentation activities on clients existing customer data as well as external data sets. The digital realm is constantly changing and evolving. New technologies are conceived and developed. Social platforms are varied and search engine algorithms change, putting more emphasis on strong content marketing. To keep across this fast-moving channel, we trial various technologies and marketing tactics to suit our client’s needs. Each solution is tailored to the specific client requirements. We produce Digital Strategies that can compose of Websites, Microsites, Search Engine Optimisation (SEO), Content Marketing, Search Engine Marketing (SEM), Social Media, CRM Platforms and marketing automation. We tie these all together along with our data and direct strategies to produce results-driven, multi-channel digital campaigns. The principles of direct marketing have not changed. The rules may be different, but the game remains the same. The only thing that has changed is the velocity. The Internet has made it easier and faster to communicate, measure and analyse…but also to make mistakes. Everything we do is based on these core direct marketing principles. Our focus is data driven digital marketing, but we never forget the foundations of traditional direct marketing. This is our history, where we learned and sharpened our skills. Our approach is data driven and based on a test, measure, refine and rollout methodology. Only by knowing what works and what doesn’t work can we maximize the return on campaigns and client ROI. We use these underpinning principles of direct marketing combined with the new digital tools to drive multi-channel campaigns that engage customers in personal, real-time dialogue which is fully accountable and measurable. The focus behind what we do is to ensure the customer is receiving relevant and timely messages. Only then will customers respond the way you intend. It’s not only what you send that counts, but also what you don’t send. Our aim is to provide clients with a much needed strategic focused, data-driven marketing approach. Our core philosophy to strategy development is understanding the target audience. We turn data into information and information into powerful insights, from which marketing strategies and effective communications can be developed. It is our belief that every marketing communication, segmentation model or marketing application development must be part of the clients overall communication strategy. We will either work to the clients current strategy or develop a new strategy together with the client. Our strength is the ability to integrate strategic marketing knowledge with a strong technical understanding. This guarantees that clients do not fall into the trap of letting technology become the driver rather than the business and its people. We are not tied to specific technologies or platforms, so we find a solution that is tailored and suited to your business. We also partner with specialists who know their technologies inside out. This keeps us at the forefront of an ever-changing digital landscape. Our core philosophy to marketing communications is based on a thorough understanding of the target audience. We leverage data, knowledge and business intelligence to create a series of interactions to create a direct communication experience with the audience. The communications from an organisation should be an extension of the brand and its value statements. It should build a two way relationship between the company and the customers and add value both to the individual customer as well as being profitable to the bottom line. By clearly defining the target audience and tailoring the offer and creative to them we increase the response and profitability of your marketing campaign.